Do you have a baby Knight in Shining Armor? This outfit comes with everything your little hero needs to save the day! 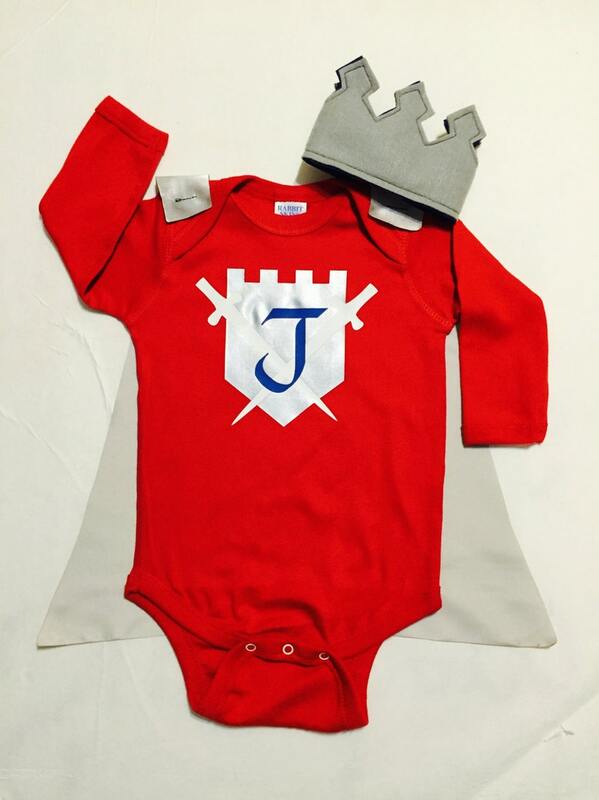 This Custom 3-Peice Medieval Knight Baby Outfit, with Bodysuit, Cape and Crown makes a perfect birthday gift, baby shower gift, photo prop, Halloween costume or a great outfit for comfy everyday superhero wear. Bring out the imaginative play in your child with this custom made set, personalized with any color combination and initial you choose. This listing features a Knightly Bodysuit with matching satin cape and coordinating reversible crown! Ultra soft velcro attaches/detaches cape on shoulders of shirt. Bodysuit can be worn alone, then quickly accessorized when duty calls. Reversible felt crown features two coordinating colors, with elastic sewn securely into crown. I use earth friendly Eco-fi felt, which is made from recycled soda bottles. ***Please select your outfit size from the drop-down menu, then write the child's Initial (and ANY color changes if needed) for personalization in the Notes to Seller box at checkout. *** IF you only specify a letter in the Notes to Seller box, then the outfit will be made in the colors shown on first picture of listing. Bodysuits run big, I usually don't recommend ordering the next size up. Black, Red, Royal Blue, Hot Pink, Purple, Light Gold, Dark Hunter Green, Orange, Silver, Turquoise. Silver, Gold, White, Black, Red, Yellow, Turquoise, Royal Blue, Orange, Green, Hot Pink, Glitter Pink, Purple, Glitter Purple. Royal Blue, Black, Silver, Red, Hot Pink, Light Pink, Purple, Light Purple, Green, Yellow, Gold, White, Orange, Turquoise. Perfect little sister version of the big kid cons times!